In December, Natalie Jost (from Olive Manna) and I were brainstorming about collaborating on a project together, and eventually we (read: Natalie) thought of the creative idea to do a Valentine's theme giveaway: small paper-covered canisters filled with goods from the both of us. We put together items inspired by our two shops, Olive Manna & Hooray, and we're giving away 2 canisters, one here on my blog and one on Natalie's. The exact contents of each canister are a surprise - they're filled with paper items like heart confetti, tags, mailing labels, photo corners, & a lot more (you'd be surprised how much we fit into these tiny canisters, we got a little crazy with it!). We hope these canisters can be used for a variety of creative projects such as packaging, gift giving, Valentine's Day, & everyday crafting. If you'd like one, simply leave a comment here to enter to win. Extra entries allowed for twitter/blog referrals. And don't forget to also visit Natalie's blog to enter for more chances at winning. Best of luck and happy crafting this Valentine's! *Update: The winner is Thea from Australia. She's been contacted, and thanks to everyone for your support! ok seriously what could be sweeter than a little canister filled with goodies from your adorable shop?! Count me in for a twitter and blog referral too! Hope u have a great Monday Alli! oh what a wonderful giveaway! Perfect for Valentines Day. 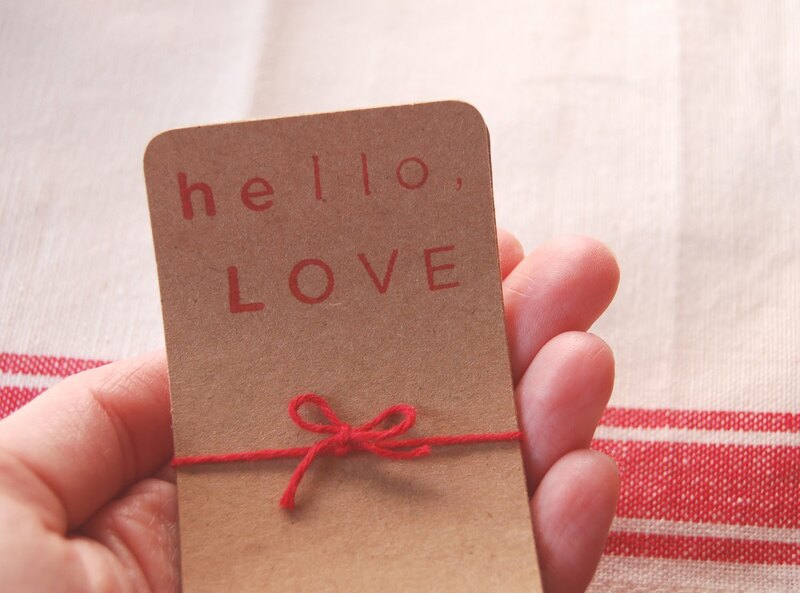 Really enjoy Natalie's Blog and Etsy, her valentine cardvelopes are so great! oh, thats really nice and inspiring! What a great idea! Those tin cans are adorable! And filled with such cool stuff! If I win, I'll make a post on my blog about what I'd do with all the stuff! ooo such a fun canister of goodies! ooh my goodness, so sweet and gorgeous! everything looks amazing, whoever wins will be very lucky indeed. Goodness, what a sweet and lovely giveaway! I am happy that you are collaborating with Natalie. I would really love to win it! 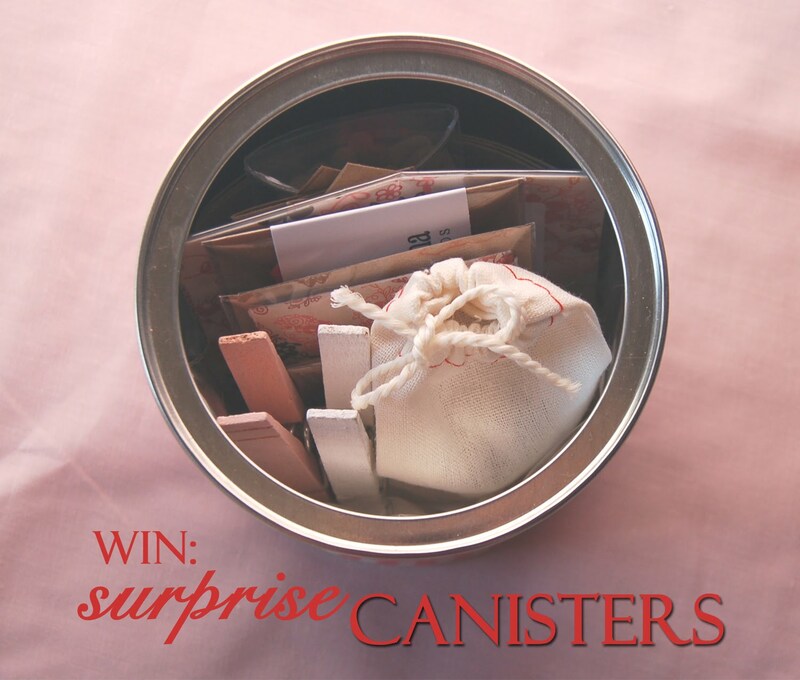 I am soooo keen to see how much lovely items you have all fitted into the canister! So very adorable...Thanks for doing this! It's getting me in the Valentine's day state of mind! Love it! Yay for a Valentine's Day giveaway! this is such a cute giveaway! 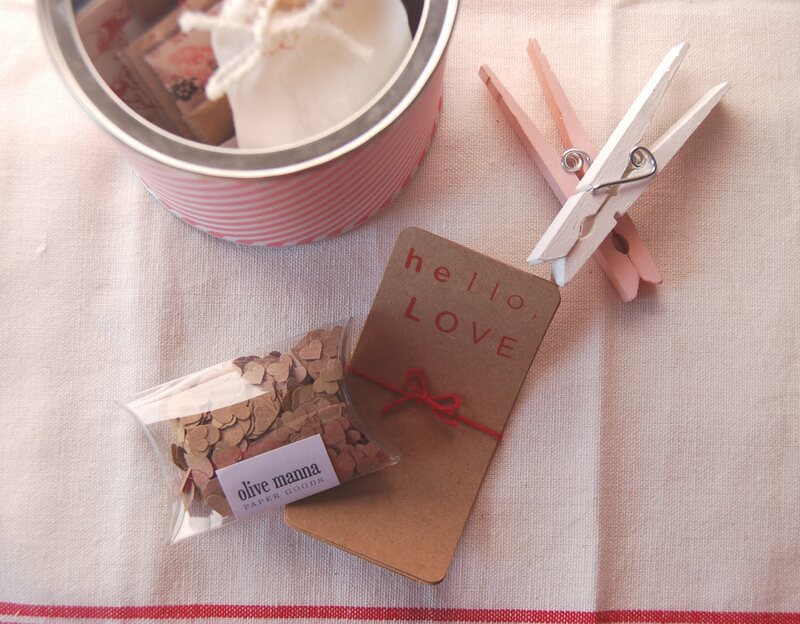 i love the little clothespins. I love how this giveaway is a surprise! Makes it so much more special, thanks! Thanks for the chance to win! I love all the items and can think of so many fun projects to do with them already! this is such a cute idea! i <3 little sweet things like these. count me in! i tweeted it as well! Oh, I love both Hooray and Olive Manna. And by the little peek, I can already tell it's my fave. Valentine's Day this year = making sangria with my single roommates. We'll drink it and talk of romantic Valentine's Days to come. LOVE this idea- it all looks so very cute! i shall blog + tweet this too. splendid! I want to win! i love this tins! Thank you so much for the chance! Happy February! What a great idea for a giveaway, Allie! I can think of so many fun things I would do with all of your pretties, not last on the list would be something special for my sweet husband on V-day. Thanks so much for the giveaway offer! Super cute! I bought my hubbs tickets to a US men's national soccer team game, so it would be fun to wrap the tickets in your gorgeous goodies for Valentine's day! 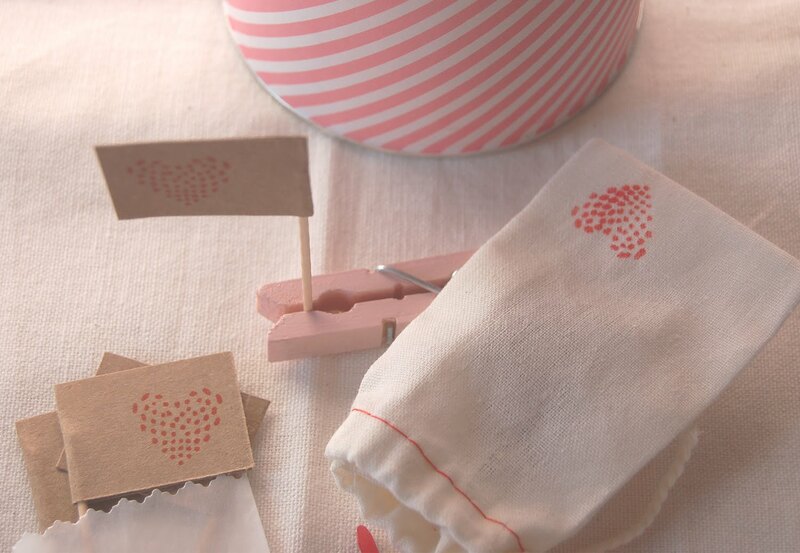 I'm making Valentine garlands and am going to hang them around the house for all my family members to be surprised by. how fun! i love suprises. the contents look really cute. this little can is truly adorable. i love the little hearts everywhere. i use stamps to make my own cards and love the retro look it gives - very cute! This giveaway is sooo cute! Thank you for the opportunity! I love this. I love making little parcels like this and sending them to friends. ooh love! what a cool collaboration. Yeah, I love your shop and I just recently ordered a shopping list notebook from Olive Manna. I don't usually do much for Valentines Day, but there is so much cute stuff online this year, I can't help myself. We will probably be going out with friends to dinner since we both celebrated our 14th wedding anniversaries this year in Jan. This is an altogether delightful giveaway! This year I created my own valentines from scratch! The design involves a petal-envelope template and mini-envelopes filled with pink and red raffle tickets. I stamped XOXO on all the tickets and they peek out of the envelope when the petals are opened. love this idea! i just finished glittering about a dozen chipboard hearts and hanging them from the chandelier above our dining room table. it's delightful. AW wow this giveaway just made my day! I would love to win this! oh oh oh oh oh! I was fawning over the picture and THEN read what it said underneath... Lovely and stylish and cute! This is so inspirational and sweet! This is so sweet! What a wonderful giveaway! A surprise canister? Sounds fun to me. I hope I win! Love the canister! A very sweet giveaway! Awh... please count me in! I just blogged about olive manna on my blog! You two make a great combo! Just blogged about this awesome giveaway! So cute! very generous of you two! I will probably be cutting vinyl stickers for my friends. This would be so fun for little notes when Hubby has to leave on trips, deployments, etc. These are so adorable! Thanks for this awesome giveaway! what a great giveaway, alli! the winner is a lucky gal, indeed! my mom and i love to use cannisters to put presents in! it is such a cute and unexpected surprise!